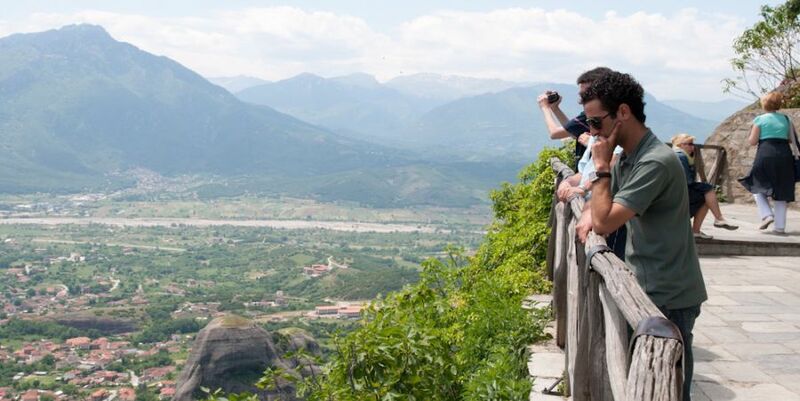 Founded by Saint Athanasios in the mid-14th century, the Monastery of the Great Meteoron (or Transfiguration), built on an imposing rock, is the oldest, largest and most important of the remaining Meteora monasteries. Shortly before he died Athanasios was joined by his successor, Saint Ioasaph. Others soon followed and by the mid 16th century the monastery was home to around 300 monks. (Today there are just three.) 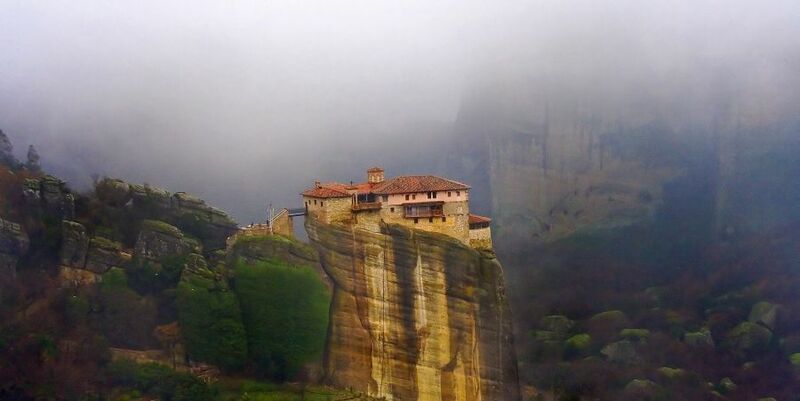 This monastery serves as the main museum for the Meteora monasteries. The Katholikon – the first church on the site, built by Athanasios and expanded by Ioasaph. 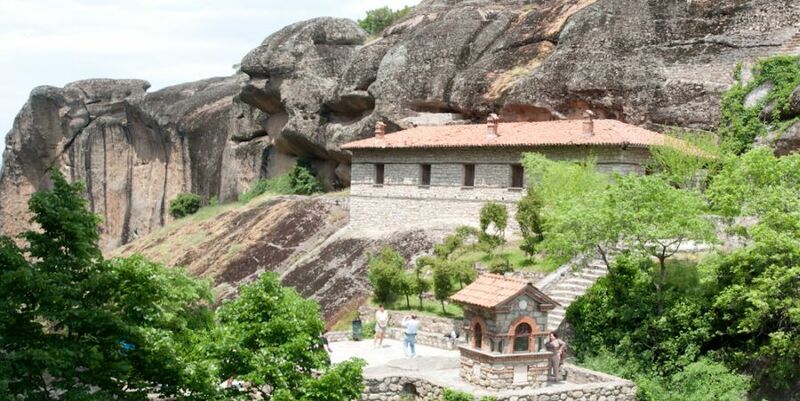 The hermitage Saint Athanasios - a small building carved into the rock. 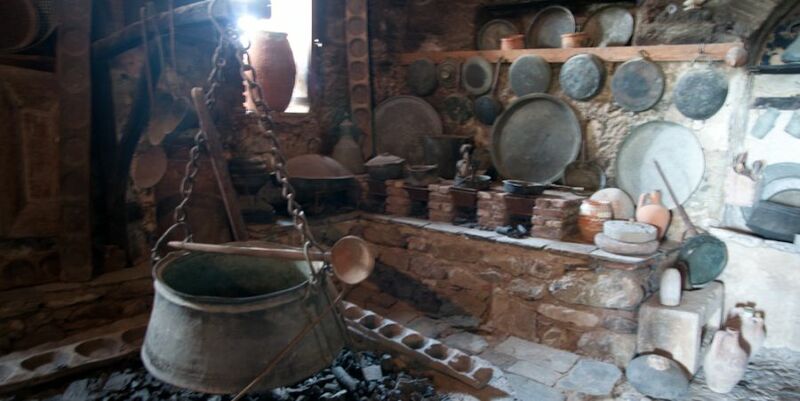 The kitchen (hestia - a domed building with a huge trivet, where, with the help of a winch,) the large cooking pot would be placed. The hospital/home for the aged. The chapel of Saint John the Baptist. The chapel of Saints Constantine and Helen). A small church with a beautiful. The chapel of Virgin Mary - situated in the cave where Saint Athanasios led an ascetic's life. The Saint Nectarius chapel - situated in the renovated north-west wing of the cells. The library - one of the richest and most remarkable existing monastery libraries, containing documents and rare printed books preserved by the monks over the centuries. 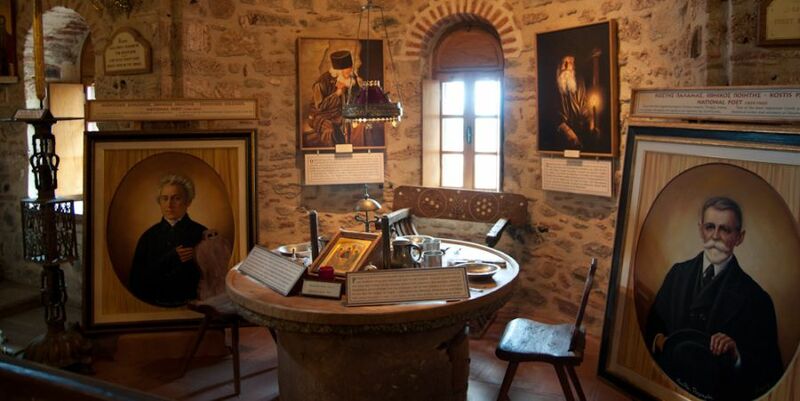 As well as those in the chapels, the monastery’s museum houses collections of treasured icons, relics, silverware, wood carvings and embroidered cloths. The Holy Monastery of Varlaam is the second largest in the Meteora complex. It bears the name of a daring who climbed to the top of the rock where he built three churches, a small cell and a water tank. After his death the rock remained abandoned for about 200 years. 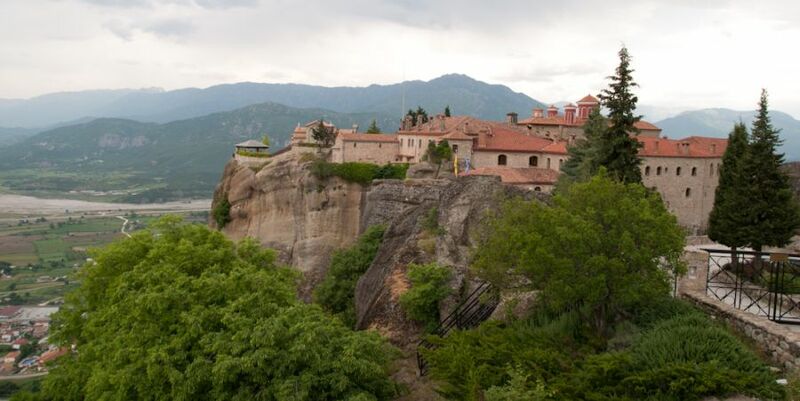 In 1518 the two brothers, Theophanes and Nektarios Apsarades reached the rock and finding it abandoned started to renovate and extend the buildings. Although the building work took less than a month, it took them 22 years to haul up the necessary materials. By the 16th century about 35 monks lived in the monastery. Today the monastic community consists of 7 monks. When the founders ascended the rock, there was no water, so over a period of many years the monks constructed a huge barrel which could hold up to 12 tonnes of rainwater. Eventually this was replaced by three storage tanks providing water for drinking, irrigation and construction. The kitchen - one of the most elegant and beautiful buildings of its kind. The chapel of Three Hierarchs. 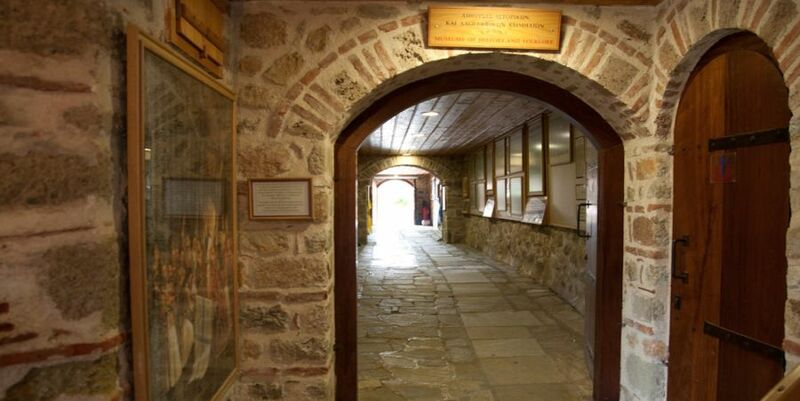 The monastery houses an important collection of about 300 manuscripts, some of which are displayed in the Sacristy, along with many other ecclesiastical relics such as post-byzantine icons, embroidered vestments, miniatures and silverware.